DV, a.k.a Digital Video, refers to the video data recorded by the digital cameras. It's developed jointly by Sony, Panasonic, JVC, Sharp, Toshiba, Canon and a number of well-known home appliances giants. 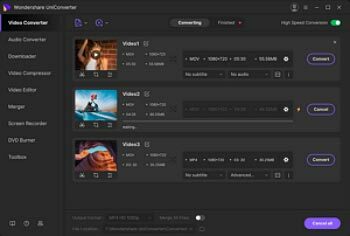 However, whatever is to share DV video to YouTube/Facebook or import DV to iMovie for further editing, you need to convert DV video to MOV format first. If you have no idea of encoding/decoding-related knowledge or don't want to go that far, you can directly try Wondershare UniConverter (originally Wondershare Video Converter Ultimate). 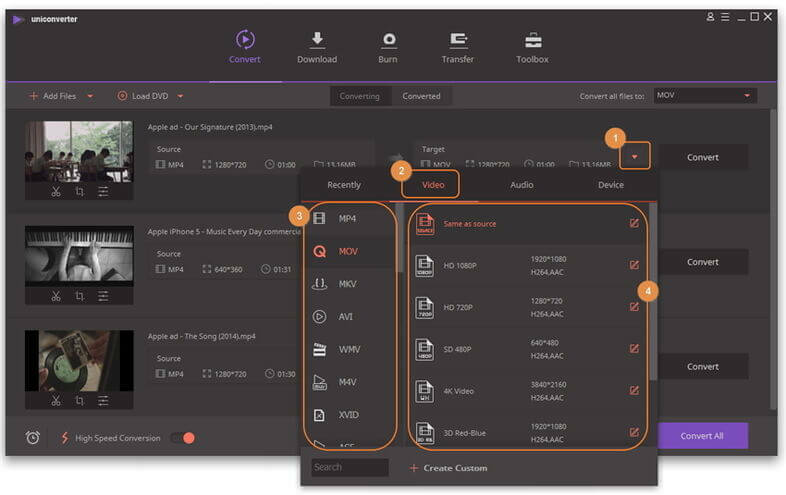 It's a comprehensive video converter tool that converts DV videos to over 1000 formats, edits any video with versatile editing features and more. Now let's walk through the details below. Convert to optimized preset for almost all of the devices. 30X faster conversion speed than any conventional converters. First of all, free download the Wondershare DV to MOV converter via the download button above and launch it after installation. Note that the following tutorial takes Windows version for example and the Mac version works almost the same. Transfer your target videos from your DV to the computer via a USB cable first, then directly drag & drop them to the program's primary interface. Or click to locate the DV files you want to convert. Go to the Target section and click the drop-down button, then a drop-down list will appear with tabs of Recently, Video, Audio and Device. To select MOV as output format, go to Video > MOV and select the specific resolution in the right. If you are not satisfied with the current video settings, you can adjust them by clicking + Create Custom to get the Setting window. 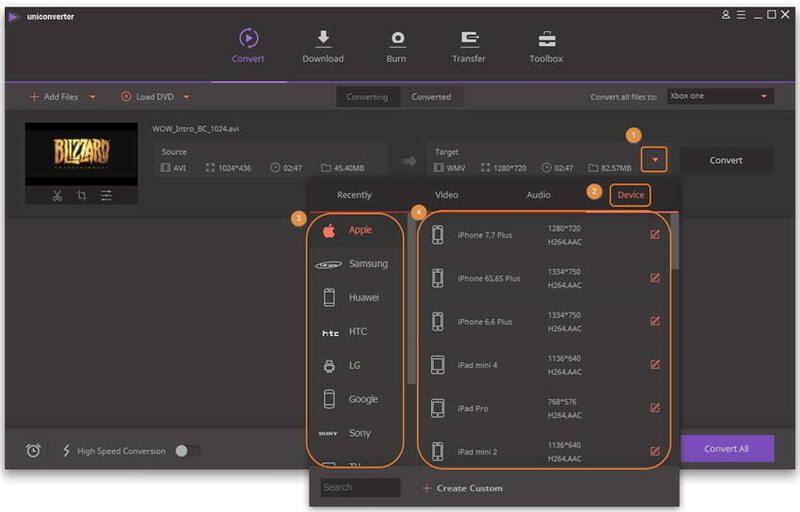 If you want to play the converted files on Apple device like iPod touch, iPad, iPhone, etc, you can choose the corresponding presets under Device category as output format. When all adjustment satisfies you, now you're coming to the last step. Click the Convert button in the right to trigger DV to MOV conversion immediately. Wondershare UniConverter (originally Wondershare Video Converter Ultimate) will do the rest for you. Tips: If you want to merge several DV video clips into a large one, just turn console Merge All Video (in the bottom right) on before converting. 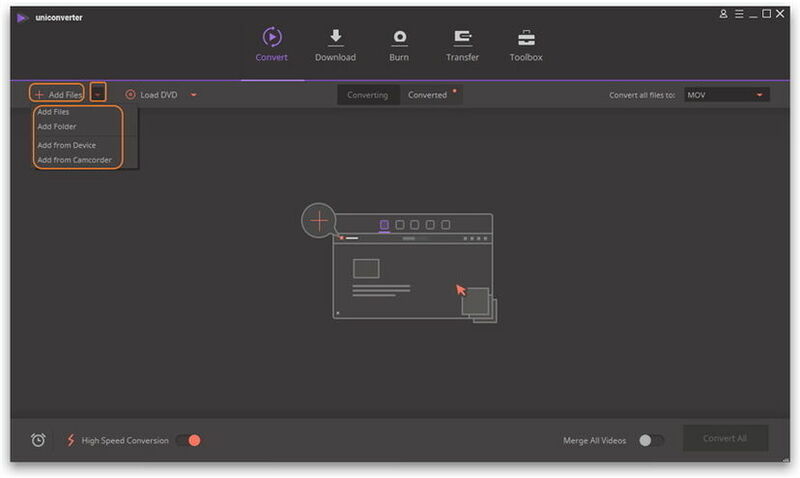 To conclude, Wondershare UniConverter (originally Wondershare Video Converter Ultimate) is an solid video converter that supports standard video formats like MP4, M4V, WMV, MPG, MPEG, MOV, TS, FLV and 3GP, HD video formats like AVCHD (MTS/M2TS), AVCHD Lite, MOD/TOD, HD WMV, HD TS, HD MPG, etc., as well as MP3, AAC, AC3 and other audio extraction without quality loss. Don't hesitate and give Wondershare UniConverter (originally Wondershare Video Converter Ultimate) a shot!